All our fabrics can be seen in our show-rooms either in Paris (France) or our Montchal production site, located in the region of Lyon. Equipped with our own designing department using computer assisted creation software, we can create any design required (jacquard, plain, print, fantasy, ...). All our designs are registered trademark. Our archives contain more than 10 000 drawings. 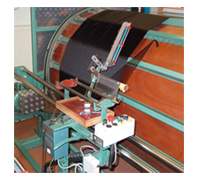 Warp preparation is carried out on various warping frames adapted for silk as well as any type of material. Our looms use electronic Jacquard equipment, some equipped with 3 meters widths allowing us to respond to all of our customers' needs. 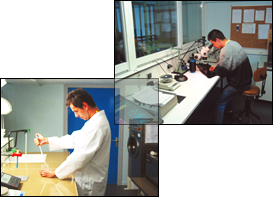 Controls during production and at the final stage are made on all items, providing an excellent quality in our fabric. As our partners include more and more often well-known fashion designers, we have acquired a laboratory in order to guarantee our quality.